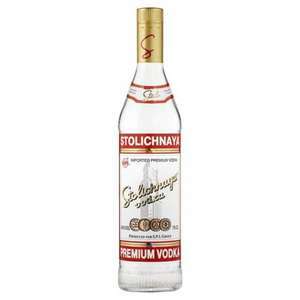 Stolichnaya Vodka 70cl was £18.50 now £12 at Tesco online and in store! My first post so please be polite! Saw Stoli reduced from £18.50 to £12 at Tesco in Burnage tonight. Also online so must be national. Perfect for having a nice quiet cocktail (or getting blind drunk) this weekend! Much, much nicer/smoother than Smirnoff. My favourite budget vodka. Is this the vodka for trendies or something? I seem to be seeing it at a lot of peoples houses lately. The flavoured one was nice. raspberry i thinkit was. will try pick some of this up, thanks. Good price if you're into brands, but to be honest I find all 'premium' vodkas taste the same to me. With other spirits I can actually tell the difference between brands, which makes it a bit more worthwhile to spend the extra. Good price if you're into brands, but to be honest I find all 'premium' … Good price if you're into brands, but to be honest I find all 'premium' vodkas taste the same to me. With other spirits I can actually tell the difference between brands, which makes it a bit more worthwhile to spend the extra. Try something like Russian Standard, it's noticeably smoother than Smirnoff, especially when chilled in a freezer. RUS is one of the few easily accessible "premium vodkas" that has quite an obvious difference taste, texture and smoothness. Best drunk straight from the freezer without ice. Texture becomes thicker, more like syrup, and you dont get any of the harsh "spice" you get from other Russian/lesser/imitation vodkas. Quick note of vodka drinking, breathe out heavily after drinking straight vodka! it reduces the "spice" of the drink. Spice is what makes most people cough when drinking strong spirits. On the subject of Stolichnaya I felt it was better than Red Square but found it on par with Smirnoff, albeit with a slightly different presentation (less spice more tang). My sincere apologies to all for sounding like a pretentious prat, I just like vodka! will try but russian standard is my special offer buy and aldi's own my budget buy - former is a vodka i can describe as tasty when frozen and sipped, darned nice, latter does not offend the senses and beats more expensive brands like smirnoff hands down. I find Eristoff really easy to drink and I know this won't make sense as it's same proof as other vodka but it doesn't seem to get me drunk. Only problem is that it's not as widely available in pubs as other vodkas. Stoli is not a budget brand. Very popular in the States and for good reason. Its great. Thats my saturday sorted thanks! See u all next week! Don't know why people class this as a budget vodka as far dearer than the budget ones. However if you want a very good vodka and aren't wanting to spend the money on a bottle of Goose then this is the best around. Pour it over ice, squeeze a slice of lemon into it then drink. Simple and superb. it's £13.79 in sainsbury's - i bought a bottle in camden town earlier this week. That's amazing! I prefer absolut, but think ill have to buy some glens soon to give it a try! No more grey goose for me! I'll save loads of money lol. I'll admit glens tastes more like the vodka I had in Poland where they frown on you if you try and add a mixer (heard it;s the same in Russia) but it's a bit strong for me. If that's the judging standard though grey goose must be like dishwasher as it's really mellow in comparison. £12 for Stoli, can't argue with that! Hopefully this will stop more idiots buying Smirnoff. For a smoother vodka that always cheaper I'd always pick Vladivar. Did my own blind testing when I worked in a cocktail bar a few years back and that was the most popular budget brand. Just bought a bottle. ID'd age 26 wearing my work suit. Awesome. Thanks OP. Just purchased 2 bottles in Clacton. Nice Vodka. Smirnoff always gives me a headache so it must have some crap chemicals in it. For those who have a Costco card, their own brand Vodka is £33 for 1.75l bottle and comes from the same distillery as Grey Goose - fantastic stuff, shame Costco is an hours drive from here! Deal posting newbie! This is simius first deal post. Help out by leaving a posting tip or just to show your appreciation for their contribution.